Thursday night: Mostly cloudy, spot shower. Lows in the 40s. 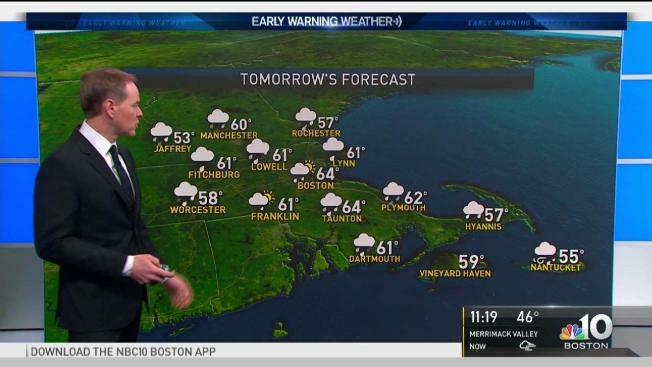 Friday: Mostly cloudy, few showers. Highs near 60. Saturday: Mostly sunny. Highs in the 50s. Early sunshine today will continue to fade behind increasing clouds. Highs will stay mild, reaching the 50s for many. Some of the warmest spots will flirt with 60. By afternoon and evening a few spotty showers will be working through, with another push of milder air arriving in New England. The wet weather will be most widespread and steadiest in parts of western and northern New England, with lighter activity near the coast. Friday will also be mild, with highs again in the 50s to near 60. But we’ll also still have showers around during the morning hours. By afternoon most of those will be gone, but skies stay mostly cloudy. Saturday will be bright with highs in the 50s. During the nighttime hours a front crosses New England from north to south. That will bring a few spotty rain showers for most, with a few snow showers over the terrain of northern and western New England. Most of that is gone by Easter Sunday, but early services will likely still be a bit on the dull side, especially near the coast. Highs will be in the 40s and 50s as cooler air works in from Canada. That cooler trend will continue into next week, with 40s to around 50 looking more common than anything else. That will be a touch below average for the early part of April. Two areas of disturbed weather will also need to be watched. One arrives with some rain or mountain snow late Tuesday into Wednesday, with another to watch by Friday. The timing will be worked out more precisely as we get closer.